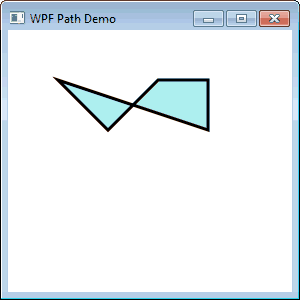 In the previous eight articles in this we've seen the capabilities of the Path class for drawing both simple and complex shapes. In this article, which is the last to consider drawing with Paths, we'll revisit the ability to combine lines, arcs and Bézier curves to make complex figures. However, rather than building shapes using lots of nested XAML elements, we will use a much more terse approach, via Path Markup Syntax. 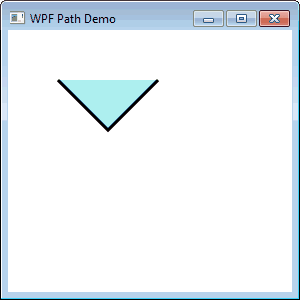 Path markup syntax let you create complex geometry using segments that are defined using a single letter command. These are followed by one or more numeric arguments that describe the segments. To demonstrate, we'll create a simple example first, then add extra segments and figures using all of the available commands. The above XAML includes some path markup language in the Data property. There are three commands shown. The first is "M". This indicates that a new figure is to be started. The current position is moved to the co-ordinates specified after the command but no lines are drawn. 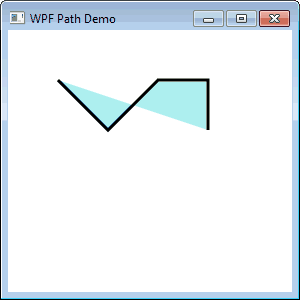 Each of the two "L" instructions tell WPF to draw a straight line from the current position to the provided co-ordinates, moving the current position to the end of the line. The resultant figure is shown below. It appears as a triangular shape because the figure is filled. The two black lines are those drawn by the markup. If you wish to draw horizontal or vertical lines, two further commands are available. "H" draws a horizontal line from the current position to the X co-ordinate provided as the single parameter. "V" draws a vertical line to the Y co-ordinate specified. Data="M50,50 L100,100 L150,50 H200 V100"
Figures can be open or closed. To automatically close a shape with a straight line between the final position and the original co-ordinates, add the "Z" command. Data="M50,50 L100,100 L150,50 H200 V100Z"